sometimes you think you have something good. and then you realize it can be better. that's how i felt about my blog. i have a very simple aesthetic and don't like clutter. but the lovely and always optimistic mervi from my best friend jules (incredible and beautiful blog, and i encourage you to visit after our little chat), has shown me that you can have more, and less, at the same time. 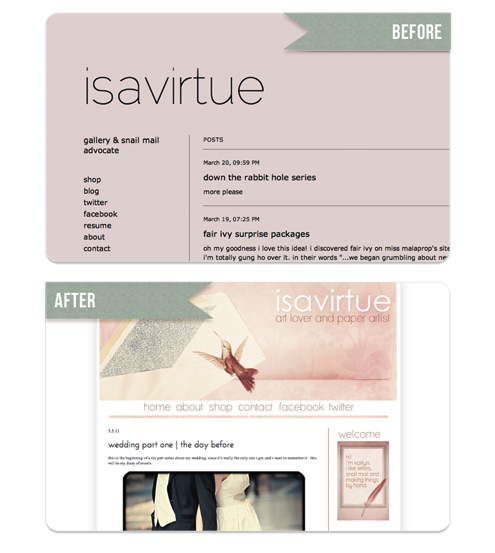 mervi worked tirelessly this week (ok, maybe she got a little tired) to recreate my blog and my website. i love the colours, the fonts and my little hummingbird post man. i couldn't have asked for someone more patient. i felt like a kindergarden kid intermittantly trying to sit on my hands and waving my arm at the teacher. i had lots of questions and ideas (most ludricrous flights of fancy, as children's ideas so often are), but mervi took into account all of them with such grace. so thank you dear mervi, for the gift of beauty and inspiration. this blog feels like a redecorated living room. you know how the living room is the kind of room that always loses out to the family room because it never feels inviting enough? no longer i say! Dare I say, I loved your previous layout. This new one is also beautiful. the colour scheme is so pretty, glad the pages finally load on my comp now! yay!